The Princess Marina Cliff Walk was established by Mr Henry Halloran, a Sydney businessman and property developer, in the 1930s on land owned by him at Stanwell Tops. He sought permission from Bulli Shire Council to develop the walk and also asked Council to make representations to obtain the consent of Princess Marina, the Duchess of Kent, for the walk to be named in her honour. Assent was granted in 1937 around the time the Princess visited Sydney. The full walking trail linked the railway stations of Stanwell Park, Otford, Lilyvale and Helensburgh and became popular with hikers in the 1930s and ’40s. The Cliff Walk had seats, shelters and lookouts and was linked to the Stanwell Tops Pleasure Park complex with its tea rooms and mineral swimming pool. The entrance to the Princess Marina Cliff Walk was opposite the Stanwell Tops stone monument which originally carried the entrance sign for the Pleasure Park. The entrance to the walk had an attractive archway of rough bush timber. A few metres into the bush and you crossed “Ye Olde Rustic Bridge” at the head of a small stream which Mr Halloran named Montague Creek. A little below the bridge, set in a small clearing on the right hand bank of the creek, is a large round picnic table and seats fashioned from bush rock and river stones, said to have been hauled from one of Mr Halloran’s properties on the Shoalhaven river. Further along the walk as the vegetation changes to open range-type scrub, there was a long avenue formed of rough hewn forked tree branches which were placed upright on the ground and linked to one another to make an avenue called “Lover’s Walk.” The remains of some of these tree forks are still evident beside the track. “Lover’s Nook”, a small covered seat built on top of a large boulder facing down into Undola Canyon, is crafted of red gravel stones, with grey and red granite and dark, almost black, river stones. A short distance further along the trail is the first lookout. This is built into a very large boulder above the pathway, with staircase and protective fence of rough bush stones all fitted neatly into place. The lookout is at tree-top height and provides a magnificent view to the Otford Valley. Just to the left of the lookout is a further set of steps opening the way to one of the many walks down into the valley floor. Moving along through stands of mighty red and blood gums and hugging the edge of the escarpment, the track dips down into a small watercourse with glimpses through to Bald Hill. A small lookout jutting into the trees provides a quite spot to observe the wildlife and affords the first glimpse into the valley floor below the waterfalls. There are many unfenced rocky outcrops which provide other vantage points. The next lookout, with a northerly aspect, provides a wonderful view of the Juliet Falls on Gills Creek, almost directly across the valley. Alongside this lookout is “the cut” which is another, much steeper pathway into the bottom of Kellys (or “Romeo”) Falls. 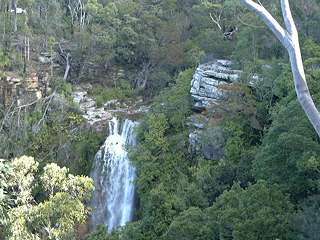 Juliet Falls can be seen more clearly from a perfectly square lookout further along, perched on a rocky outcrop and built of smooth riverstones. There are two long seats across the rear edges to rest and enjoy the view. Getting closer to Kellys Falls, on the left of the trail, taking advantage of the natural surrounds, is a large semi-circular seat made from bush rocks and red gravel rocks, set among the banksia and sheoaks. High on the left behind the seat is a small cave, complete with small bush rock seat. The track forks by another track-side resting place with the trail going on to higher ground up to Kellys Falls car park. The main track continues over the waters of Kellys Creek and the falls. Undola Canyon Lookout on the northern side of the falls looks straight down into the depths of the valley and black water pool at the foot of the falls, and out over the valley. Further along is “Oceanview” lookout which, as the name suggests, looks straight down Undola Canyon to the Pacific Ocean and Bald Hill. Juliet Falls on Gills Creek can be seen at the last lookout on the walk. 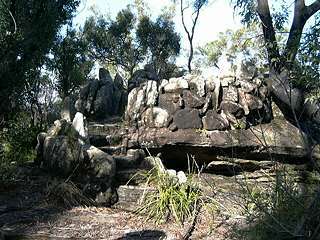 This is an extensive structure of bush rocks topped with red gravel pieces and is called “Falls View” lookout. Both falls can be viewed from here and with its southerly aspect we can follow the valley which becomes the headwaters of the Hacking River, through to Bald Hill and then on to Otford. Behind this lookout there were once two large steel towers from which the Australian flag was regularly flown. Today the Cliff Walk is overgrown, with many of the features damaged. None-the-less, the land is an escarpment reserve and there is growing pressure on Wollongong Council to restore the trail. Illustrations: Top; Kellys Falls showing only the top half of the falls, and also showing the main lookout to the right with pipe and wire security fence. Rainforest obstructs the view to the lower half of the falls. The falls make a direct descent to the pond below. 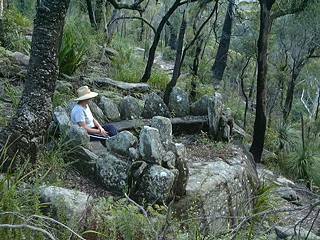 Middle; The first lookout on the cliff walk, stairs, seats and lookout constructed of bushrock. Stairs to the left of the rock descend to the base of Kellys Falls. Bottom; one of the many “lover’s seats”. Note that the bush along the escarpment was heavily burnt out by the “Black Christmas” bushfire, and has regenerated. Thankfully the Otford Valley didn’t burn.